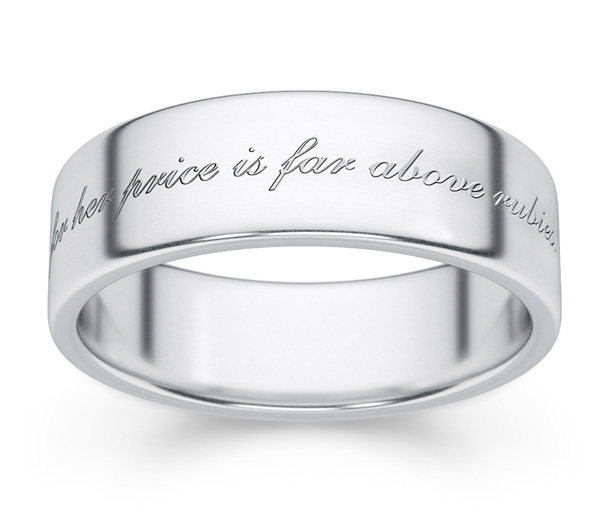 "For her price is far above rubies" from Proverbs 31, verse 10 is engraved on the outside of this .925 sterling silver Bible verse ring. You can also personalize the band with your own custom inscription on the inside of the band in the same script font. Perfect as a sterling silver wedding band, purity ring, or stand alone Christian ring. The full verse is from Proverbs 31:10, taken from the KJV: "Who can find a virtuous woman? for her price is far above rubies." The silver band is available in 4mm through 8mm widths; shown here in 6mm. The ring available for men or women, based on the ring size that you choose. Also available in white or yellow gold, displayed below. We guarantee our Proverbs 31 Bible Verse Ring in Sterling Silver to be high quality, authentic jewelry, as described above.